This article will help you learn the basics about lung anatomy and physiology. In nursing school, you will need to know the anatomy of the lungs and how gas exchanges takes place. This knowledge is very important when you are learning about disease processes such as COPD , Pneumonia, and other respiratory disorders. This review is part of a respiratory review series…so be sure to check out those reviews as well. 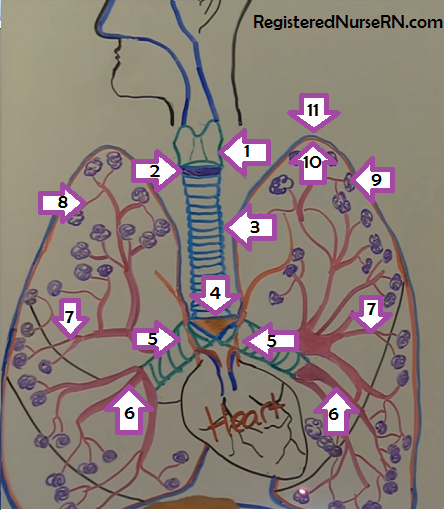 In addition, don’t forget to take the lung anatomy quiz. Then air enters into the bronchioles, alveolar ducts, and alveolar sacs for gas exchange. The diaphragm helps the body inhale and exhale air. The diaphragm will contract downward which causes negative pressure in the lungs. This allows air to rush into the lungs. Then the diaphragm relaxes back into a dome-shaped position which allows the high pressure that has built-up in the lungs to be forced out with exhalation. 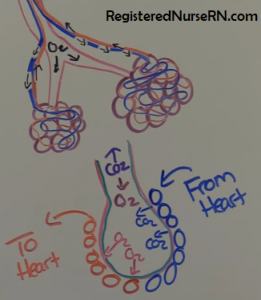 The alveolar sacs contains capillaries that supply the pulmonary artery (which takes UNOXYGENATED blood to the lungs to receive oxygen) and pulmonary vein (which takes OXYGENATED blood back to the heart to replenish the body). These capillaries have a thin membrane that allows the transport of oxygen and carbon dioxide. Oxygen is inhaled and crosses over the membrane and attachs to the red blood cells….while carbon dioxide (a waste product from metabolism) transports from the exhausted cell into the respiratory system to be exhaled.